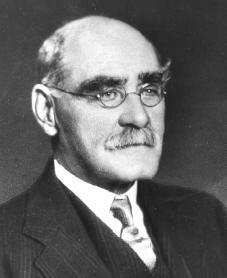 Joseph Rudyard Kipling was born on December 30, 1865, in Bombay, India. His father was professor of architectural sculpture at the Bombay School of Art. In 1871 Kipling was sent to England for his education. In 1878 Rudyard entered the United Services College at Westward Ho!, a boarding school in Devon. There young "Gigger," as he was called, endured bullying and harsh discipline, but he also enjoyed the close friendships, practical jokes, and merry pranks he later recorded in Stalky & Co. (1899). Kipling's closest friend at Westward Ho!, George Beresford, described him as a short, but "cheery, capering, podgy, little fellow" with a thick pair of spectacles over "a broad smile." His eyes were brilliant blue, and over them his heavy black eyebrows moved up and down as he talked. Another close friend was the headmaster, (the principal of a private school) "Crom" Price, who encouraged Kipling's literary ambitions by having him edit the school paper and praising the poems which he wrote for it. When Kipling sent some of these to India, his father had them privately printed as Schoolboy Lyrics (1881), Kipling's first published work. Kipling referred to less highly developed peoples as "lesser breeds" and considered order, discipline, sacrifice, and humility to be the essential qualities of colonial rulers. These views have been denounced as racist (believing that one race is better than others), elitist (believing oneself to be a part of a superior group), and jingoistic (pertaining to a patriot who speaks in favor of an aggressive and warlike foreign policy). But for Kipling, the term "white man" indicated citizens of the more highly developed nations. He felt it was their duty to spread law, literacy, and morality throughout the world. During the Boer War, Kipling spent several months in South Africa, where he raised funds for soldiers' relief and worked on an army newspaper, the Friend. In 1901 Kipling published Kim, the last and most charming of his portrayals of Indian life. But anti-imperialist reaction following the end of the Boer War caused a decline in Kipling's popularity. When Kipling published The Five Nations, a book of South African verse, in 1903, he was attacked in parodies (satirical imitations), caricatures (exaggerations for comic effect), and serious protests as the opponent of a growing spirit of peace and democratic equality. Kipling retired to "Bateman's," a house near Burwash, a secluded village in Essex. Kipling now turned from the wide empire as his subject to simply England itself. In 1902 he published Just So Stories for Little Children. He also issued two books of stories of England's past— Puck of Pook's Hill (1906) and Rewards and Fairies (1910). Like the Jungle Books they were intended for young readers but were suitable for adults as well. His most significant work at this time was a number of volumes of short stories written in a different style—"Traffics and Discoveries" (1904), "Actions and Reactions" (1904), "A Diversity of Creatures" (1917), "Debits and Credits" (1926), and "Limits and Renewals" (1932). Rudyard Kipling's early stories and poems about life in colonial India made him a great favorite with English readers. His support of English imperialism (the policy of extending the rule of a nation over foreign countries) at first contributed to this popularity but caused a reaction against him in the twentieth century. Today he is best known for his Jungle Books and Kim, a Story of India. Carrington, Charles Edmund. Rudyard Kipling: His Life and Work. London: Macmillan, 1955. Gilmour, David. The Long Recessional: The Imperial Life of Rudyard Kipling. New York: Farrar, Straus, and Giroux, 2002. Ricketts, Harry. Rudyard Kipling: A Life. New York: Carroll & Graf, 2001. Wilson, Angus. The Strange Ride of Rudyard Kipling: His Life and Works. New York: Viking Press, 1978.